Students living in boarding schools and colleges kept in touch with their families and friends through letter writing. At most schools, the arrival of the mail was an important daily event, and as shown in the photograph from the 1913-1914 catalog, this was true for girls at Chevy Chase Junior College. 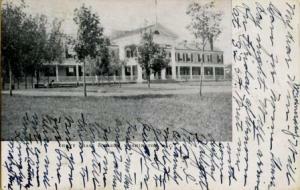 The picture postcard, a very fashionable form of communication in the first decade of the 1900s, became popular with Chevy Chase students. Picture postcards began as a form of souvenir in the 19th century, and Chevy Chase students may have bought them for this purpose. Interestingly, Dr. and Mrs. Barker, the first owners and principals of the school, sent postcards with a printed photograph of the school in order to communicate with potential students -- a form of marketing. Chevy girls used the cards to write to their parents and friends, especially when they first arrived at school in the fall. 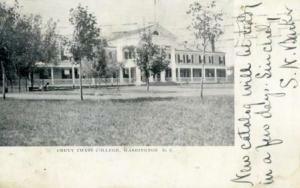 A number of the Chevy Chase Junior College postcards in the Chevy Chase Historical Society collection were postmarked between 1907 and 1909, coinciding with a period when picture postcards were extremely popular. The Chevy Chase picture postcards fall into three categories: postcards addressed to girlfriends; postcards addressed to boyfriends; and the more formal postcard, probably just one of many, sent by Dr. Barker. Writing on the image side of the postcard was common in this period because the U.S. Post Office didn’t allow messages on the same side as the address. In 1907, however, postcards were allowed to have a “divided back” with room for both the message and the recipient’s address. To Miss Catherine Cain, Hazlehurst, Mississippi, 1906. 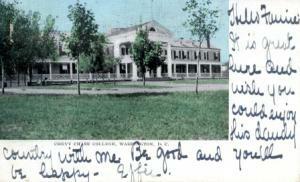 A similar postcard was sent to Miss Winnie Elgin, Maysville, Kentucky, perhaps from a Chevy Chase student to her sister. Although much of the handwriting across the front is difficult to read, Miss Elgins is asked by the postcard writer to "kiss mother and father for me, and tell them to kiss you for me." To Miss Winnie Elgin, Maysville, Kentucky, 1906. A color version of the same card was sent to Miss Fannie Anthony in Hackensack, New Jersey in October 1905 -- perhaps by a new student at Chevy Chase. 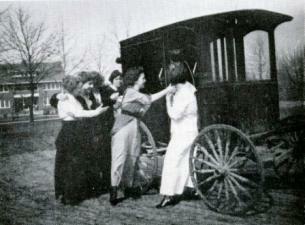 To Miss Fannie Anthony, Hackensack, New Jersey, 1905. It is great here and wish you could enjoy this dandy country with me. Be good and you’ll be happy.